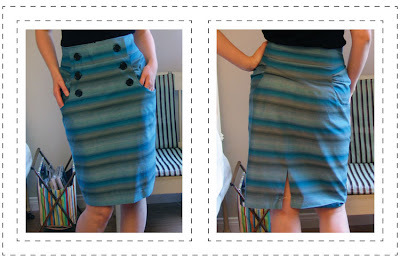 This weekend I whipped up this sailor style button-front skirt using BurdaStyle pattern Kasia 6012. (The pattern is free so check it out!) 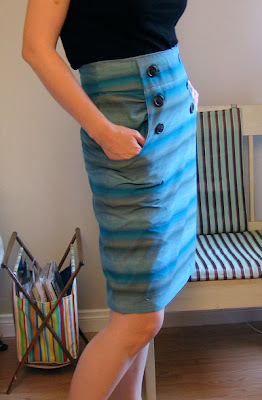 The skirt is very close fitting with a high waist, center zipper and two front pockets. 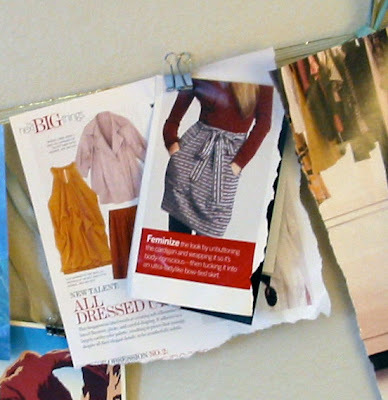 When I saw the pattern, I was reminded of this skirt hanging on my inspiration wall (above). Then, I found the striped fabric at the thrift store last weekend. It was meant to be. I'm pleased with the final result even though the construction was more challenging than I had anticipated. The front and back feature gathered inserts (referred to as yokes). The pattern has asterisks to show where to make the gathers but I couldn't find matching points on the skirt for proper placement. I was also confused by a number of instructions, particularly number 7. I figured it out fine but was a little frustrated. Be aware that the skirt requires a zipper at least 10 inches long. I had expected to a standard 7 inch but the high waist really needs a longer zipper. The pattern is very, very close fitting. I'm between just barely (1/4 inch) larger than a size 40 so that's what I cut. I had to let out the side and back seams as far as they'd go to make sure I'd be able to sit comfortably. For safety's sake, cut larger than you need. However, if you use fabric with a slight stretch it might be a perfect fit. If you plan on making any size adjustments at the center back, I recommend cutting two pieces for the center back waistband. In the pattern, the center back waist is cut on the fold. Add a seam allowance to the folded edge and you'll be able to adjust the size more easily. If I were to make the pattern again, I'd probably not do the gathered yokes on the backside and definitely cut more seam allowance in the hips and rear (unless using a stretch material).